This photo of the choir and servers from St Andrew’s Church in Tarring was featured in Looking Back a few weeks ago. The photo, taken around 1947, was sent in by Lyle Milner, who is pictured on the far left of the front row. Lyle’s brothers, David and John, are fourth and fifth from left on the front row. 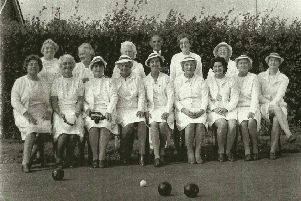 Chris Green, archivist at St Andrew’s Church, has written in to name most of the other people in the photo. On the back row, Chris names, from left to right – Jimmy Horn, unknown, Ron White, Miss Addenbrooke, Phyllis Bailey, Fred Hunt, Mr Chipper, Bill Redman (reader), Mrs Godber, next three unknown, Ella Golds, Maurice Williams. Middle row – Mr Braden, Robert Kirby (organist and choirmaster), William Coburn Cowper (churchwarden), Rev John Godber (rector), Rev Harold Henshaw (curate), Herbert Lovelock (churchwarden), Wing Commander White, Arthur Clift (assistant organist). Front row – Lyle Milner, unknown, Colin Chapelle, David Milner, John Milner, unknown. Do you recognise any of the remaining unknown people in the photo?